TO BE OR NOT TO BE…….. In the light of this promise residents might well wonder why the contractors subsequently sealed off Station Walk with what was obviously a strong, secure, and permanent fence. When challenged about this they continued to insist that the closure of Station Walk was only temporary, although they declined to offer a re-opening date, despite constant pressure from us to do so. It is interesting to note also that the piling works they claimed as the excuse for the closure have still not begun, even though a full month has passed since the closure of the footpath. The good news is that a new promise was made at the most recent forum meeting on Tuesday 19th February, to reopen a footpath along the original north/south line between the caretakers office at the top of Grenfell Road and the corner of Lancaster Road. The bad news accompanying this announcement was that it wouldn’t be possible (they said) for about three weeks. 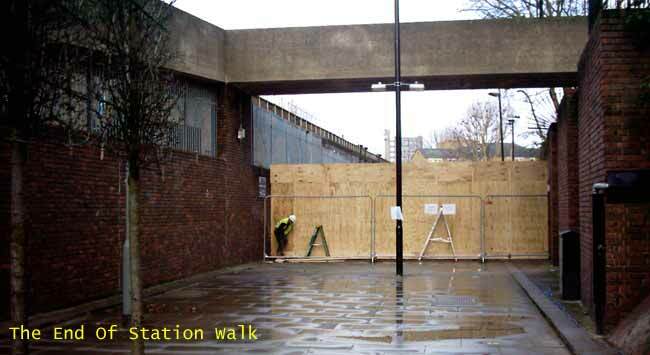 The plan to reopen this footpath apparently resulted from their belated admission that they would not, after all, be able to reopen Station Walk, as they had previously promised. They said they had encountered unforseen problems during the works in that area that would make it impossible to reopen the Silchester Road end of Station Walk until the construction works have finished. Let’s not forget, however, that they have solemnly promised to reopen Station Walk, and to keep it open “in perpetuity” when the KALC project is finally completed. Anyway, it seems that we can now expect a footpath to Lancaster Road to be reopened from about Tuesday 12th March. We would advise, however, several notes of caution. It’s been a full week since this new promise was made and, so far, there are no visible signs on site of works to erect the fencing this footpath will require, presumably a secure wooden fence just as elsewhere around the site. We also know, from previous dialogue, that the Leadbitters project manager has been very resistant to a footpath along this line because it would effectively cut the KALC site in two, making communication between the Academy site and the Leisure Centre site very difficult for his workers. Last, but not least, given the history of lies and broken promises previously with regard to Station Walk, questions remain as to whether we can ever trust statements issued, or promises made, from whatever official source associated with this despised KALC development. WE’LL JUST HAVE TO CROSS OUR FINGERS AND HOPE THAT THEY WILL DELIVER ON THIS ONE.